Ginger is the rhizome of the plant Zingiber officinale. To form the ginger used in cooking, the rhizome are first dried then put powder. 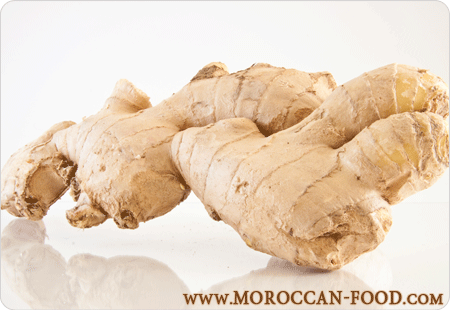 The word "ginger" comes from Latin zingiberi, the Moroccan word for it is "skinjbir". Arabs fetched ginger from East Africa, more precisely from Zanzibar. Arabs called the inhabitants of Zanzibar "zenj" word they gave to the spice. It is one of the main ingredients of Moroccan cuisine, it is used in most tagines or couscous. Ginger has digestive properties, relieves nausea, aids digestion, he have anti-inflammatory virtues and help to reduces cholesterol. It is a spice that can be used anywhere without the risk of being wrong.